Selecting a new fence for your property can be a confusing process. And what works for someone else’s property might not work best for yours since every homeowner can have a different set of needs. The aesthetics of the fence can be a priority for some, whereas the level of security or privacy can be more important for another. Other factors will influence your decision too such as your terrain and whether it’s level or sloped. That’s why utilizing a good, reputable contractor is necessary to help you make the right decision for your property. Security is often a significant factor when considering the type of fence you want to be installed. If this is the main priority for you, take into consideration the kind of fence that will contain and protect your home best. A material such as the Simteck Vinyl Fencing is an excellent option for this. It provides a secure and robust barrier that can help shield your home from any lingering eyes. And with reinforced galvanized steel in each post and panel, it can withstand a great deal of force. If you’re a pool owner with small children or pets at home, then, safety is, of course, an important factor when you let them out in the yard to play. 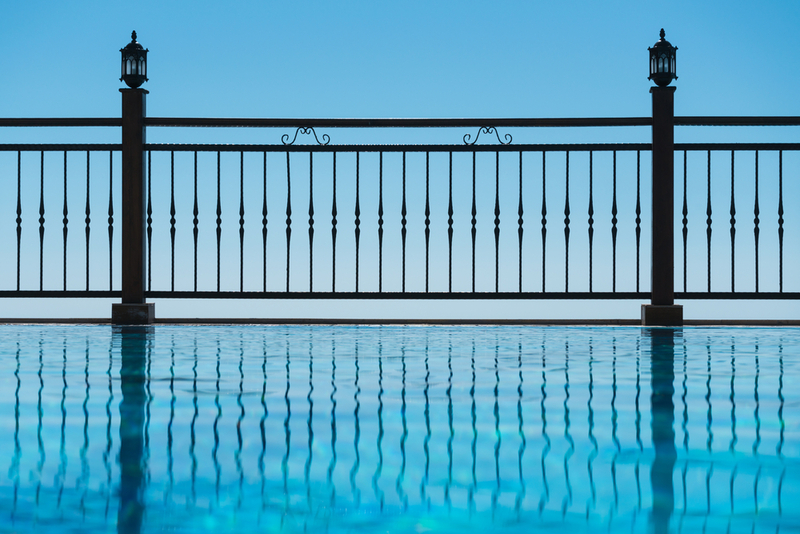 Having a fence design that will prevent children or pets from squeezing through it or gaining easy access outside or to the pool area when no adults are present, is crucial. In this case, you may want to consider a material like PVC fencing. Often referred to as the “Cadillac” of fences, this material incorporates aluminum inserts for reinforcement, along with heavy-duty self-closing PVC hinges with key-lockable entries. So it can give you the extra safety, security, and peace of mind that you need. Different fencing needs can also boil down to the type of terrain that you have. For example, there are some fencing styles that are not ideal or recommended for sloped or steep ground. This can include iron fencing and PVC fencing. Also, if your location is susceptible to high wind gusts, choosing an extra durable, reinforced design that can withstand hurricane force winds like Simtek Vinyl, is a must. If you’re simply aiming for aesthetics and an enhanced curb appeal for your home, there are some great options to choose from. Materials like the Western Red Cedar, Ornamental Iron fence or even the Simtek Vinyl which includes a realistic stone appearance, can all provide rich, elegant, and practical choices for your home. When you’re ready for a new fence, give the experts a call at Fence Masters. Our team can assist you with any questions and help you select the right fence for your needs. Contact us today to get started!